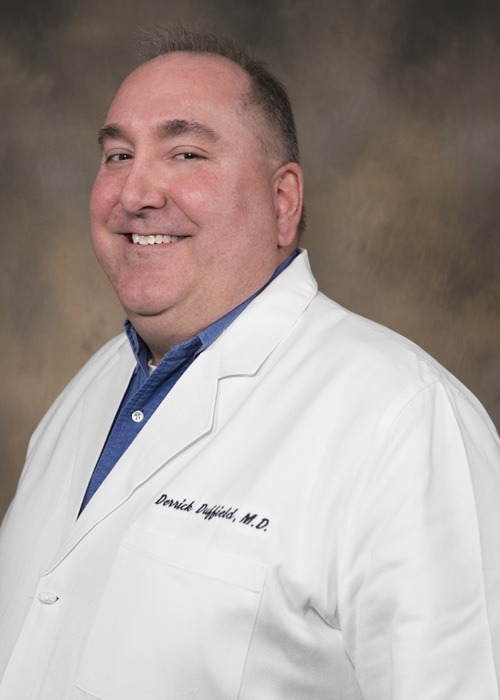 Derrick R. Duffield, MD, is a physician at Hattiesburg Clinic Immediate Care. Duffield received his medical degree from Louisiana State University School of Medicine in Baton Rouge, La. He completed a family medicine internship and residency at the University of Mississippi Medical Center in Jackson, Miss. He is board certified in family medicine by the American Board of Family Medicine and has professional affiliations with the American Academy of Family Physicians and the Mississippi Academy of Family Physicians. Aside from his training and work in family medicine, Duffield has extensive experience in urgent care and emergency medicine. At Immediate Care, he provides treatment for acute illness and minor urgent care needs. Immediate Care offers extended hours and weekend services for patients who suffer from acute illnesses and/or minor emergencies that need immediate attention. The physicians also provide referrals to Hattiesburg Clinic’s specialists for treatment of ongoing problems. *Express Care and Telemedicine visits must be scheduled through Iris. 7 p.m. – 8 p.m. is reserved for Express Care and Telemedicine only (No walk-ins).